Well this is definitely not a one layer card - big grin. 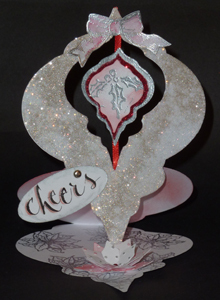 I was in a mood to do an easel card using the ornament die set from Spellbinders, and then there was a color challenge I liked and then there was a recipe I wanted to use... you know the story - and this is the result. This week one lucky Created By Hand Challenge participant will receive one Quietfire stamp . The winner will be randomly chosen and posted with the Sampler! Happy creating! I'm using a holly leaf design element from the latest Xmas rubber from Quietfire Design - it's nicely flourished leaves. Absolutely wonderful! Love that ornament die. Thanks so much for playing along in the challenge at Cooking It Up with Katie and we hope to see you again for our next challenge. Happy Holidays. Thanks for joining us over at Top Tip Tuesday this week for our 'White, Silver & a Hint of...' challenge. Don't forget you could be in the running for another prize if you share a Top Tip with us - just add (TIP) after your name when you link. Beautiful project Yogi! The shimmery ornament looks fabulous! This ornament is beautiful! It will look great on a tree. Thanks for playing with us at Going Grey with Scrap-Creations. Beautiful! Such an unusual shape for an easel card too - but it works really well. This is so wonderful. I love that it is 3D and each part just sings by themselves. Thanks for joining us at Stamptacular. Lovely card, Thanx for joining us at digistamps4joy, and good luck. What a great shaped card! Thanks for joining us at stamptacular sunday and I wish you luck on the challenge. Hope we see you soon again at stamptacular. Wow, what a make! Thanks for sharing your creation with us at Fab'n'Funky Challenges. Hope you can join us in January. super cool easel card using this ornament die! Thanks for joining us at Going Grey with Scrap-Creations this week. So unique, great ornament easel card! Thanks for joining the Silver, White and Hint Challenge at Top Tip Tuesday. Well done Yogi, what a wonderful take on an easel card. Thanks for joining us over at Crafty Cardmakers this time. Thanks so much for joining our Digistamps 4 Joy "Anything Goes" Challenge with your beautifully executed creation!